I have previously written about Dylan Klebold, Karl Pierson, and Chris Dorner's support for gun control. Now as AWR Hawkins notes, Elliot Rodger, who killed six people in Santa Barbara, came from a family of strong gun control advocates. President Obama, who last year lifted the 17-year ban on studies of violence involving firearms, included $10 million for the research in his 2015 budget proposal. But that proposal went down along with the rest of Mr. Obama’s spending plan in a crushing 413-2 defeat in the House. “It is time we study the issue of gun violence like the public health crisis it is,” Mr. Markey said. “If we want to prevent injury and deaths from guns, we need to know what can be done to prevent it. No one should be afraid of more nonpartisan, scientific research of this issue — not Democrats, not Republicans and not the [National Rifle Association].” . . .
Fox News has a discussion here. UPDATE: As usual, the initial media news stories got fundamental facts wrong here. Of particular interest, is that half the people killed here were stabbed to death. Santa Barbara County Sheriff Bill Brown said early Saturday the person who carried out "this atrocity" was "severely mentally disturbed." Fox News confirmed that several of the dead were killed at a sorority house. Brown said that investigators were familiar with a YouTube video titled "Retribution" and were looking into whether the person in the video was linked to the killings, KEYT-TV reported on its website. In a rambling rant, the young man in the video promises to take revenge on sorority girls who had rejected him over the years. "Tomorrow is a day of retribution," the man in the video says into the camera while sitting in the driver's seat of a luxury car. . . .
Santa Barbara County is essentially a gun-free zone, where only 0.009 percent of the adult population is allowed to carry a permitted concealed handgun for protection (about 30 out of an adult population of 333,000). The extremely few people allowed to carry are undoubtedly politically well connected individuals who were unlikely to have been in the part of town where this attack occurred. As we have seen over-and-over again, these multiple victim killers pick out places where they know that there victims aren't going to be able to defend themselves. After a three judge panel decision earlier this year to strike down San Diego's virtual ban on concealed carry, the full 9th Circuit Court of Appeals is now considering whether to uphold this decision. One can only hope that their decision comes soon. UPDATE: As of February 2014, Santa Barbara County had 53 permits out of an adult population of 337,000 -- a rate of 0.016 percent. The rate was virtually unchanged from 2011. UPDATE: The killer here repeatedly stab to death by three of his roommates before he shot six people to death. It also appears that the killer committed suicide. Those were first ones killed. Don’t carry long guns into Texas businesses.That was the message that gun-rights groups delivered Thursday to tens of thousands of supporters statewide through an open letter released to the media. If that’s not enough incentive, officials remind Texans that long guns aren’t allowed in businesses that sell alcoholic drinks. Any business in violation could lose its permit to sell drinks, and any person who violates the law faces criminal trespassing charges, according to state officials. More than anything, leaders of the effort to make open carry legal in Texas fear that the uproar over efforts to carry long guns into local restaurants is detracting from their overall goal. “We ask that members take a step back and make an objective assessment of what we are trying to accomplish and help us get open carry passed for everyone,” according to the letter jointly sent out by Come and Take It Texas, Texas Carry, Gun Rights Across America and Open Carry Texas. “We must be willing and able to recognize what works and what doesn’t, but we need your help to make these efforts a success.” . . .
Statewide leaders of the movement — who are also encouraging supporters to consider switching from long guns to black powder revolvers — say they needed to reach out to fellow open-carry advocates to make sure they draw the right kind of attention to the movement. “We think that the groups have grown so large so fast and we have so many new people,” said Terry Holcomb Sr., a pastor and president of Texas Carry. “With all the mistakes we’ve seen recently, we decided we needed to go ahead and put the policy out.” . . . . The main point of allowing people to carry guns is protection, not intimidation. And on that point I have generally favored concealed versus open carry. Three people were killed and one badly injured in a shoot-out Saturday near the Jewish Museum in Brussels city centre, Belga news agency said, quoting firefighters' emergency services. "I am shocked by the murders committed at the Jewish museum, I am thinking of the victims I saw there and their families," Belgian Foreign Minister Didier Reynders said on Twitter. . . . But remember this news story from last October where CNN reported that the Obama Administration warned insurance companies not to discuss Obamacare problems. Meanwhile, you are already seeing huge increases in the cost of insurance premiums even before the problem discussed above goes into effect.
. . . In Pennsylvania's case, the judge who threw out the ban was appointed by Republican President George W. Bush. Only one other judge -- of the eight who have ruled against gay marriage bans since the DOMA decision -- is Republican-appointed. The other is Bernard Friedman, a U.S. District Court judge in Michigan who struck down that state's gay marriage ban in March, though the decision is being appealed. Friedman was appointed by Ronald Reagan. Three of the judges -- in Oregon, Virginia and Utah -- were appointed by Obama in the last few years. Two were appointed by Clinton. One, in Idaho, was appointed by regional judges. Several of these cases are still being litigated. In 29 states, judges are being asked whether gays should have the right to marry. . . .
UPDATE: Piketty is being accused of deliberately lying about his data to get the results that he wants. Piketty altered U.K. data to show that wealth distribution there is worse off than it appears to be. Piketty says the share of income going to the top 10% never fell lower than 60%, and since the end of the 1970s has returned to 70%, a level not seen in 70 years.But the data Piketty himself cites shows the top 10% share of wealth is no greater than 50%, and may be as low as 42%. Giles writes: "This appears to be the result of swapping between data sources, not following the source notes, misinterpreting the more recent data and exaggerating increases in wealth inequality." Below is the chart. 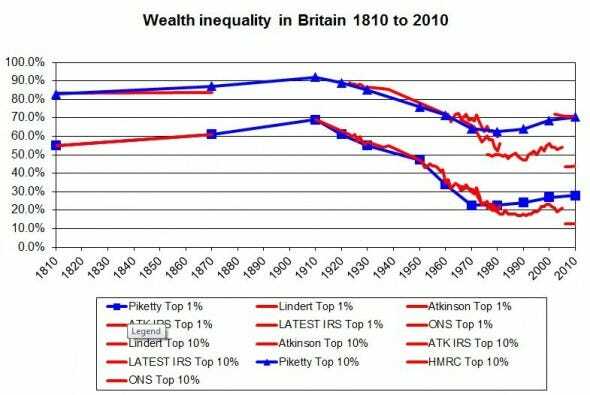 The right-most portion of Piketty's blue trend line showing the share of wealth owned by the top 10% of Britons ends up well above what's suggested by the data, in red, that Piketty himself cites. Meanwhile, just one official data point for the top 1% share of wealth aligns with Piketty's blue line. But Giles said the source of that data said it was not suitable for the kind of calculation Piketty is trying to make. "Prof. Piketty ends his series taking at face value the level of the HMRC data, despite HMRC saying clearly the data is not suited for that purpose, nor is it consistent with the old Inland Revenue Series which Prof. Piketty uses for earlier years. This latter point is also clearly stated in the notes to the source data.". . . ORIGINAL: The Financial Times has "found mistakes and unexplained entries in his spreadsheets, similar to those which last year undermined the work on public debt and growth of Carmen Reinhart and Kenneth Rogoff." The investigation undercuts this claim, indicating there is little evidence in Prof Piketty’s original sources to bear out the thesis that an increasing share of total wealth is held by the richest few. For example, once the FT cleaned up and simplified the data, the European numbers do not show any tendency towards rising wealth inequality after 1970. An independent specialist in measuring inequality shared the FT’s concerns. . . . Professor Joseph Stiglitz of Columbia University said Prof Piketty’s “fundamental contribution” was the provision of data on the distribution of wealth. . . . .
Thomas Piketty’s impressive and much-discussed book Capital in the Twenty-First Century has brought considerable attention to the problem of rising economic inequality. But it is not strong on solutions. As Piketty admits, his proposal – a progressive global tax on capital (or wealth) – “would require a very high and no doubt unrealistic level of international cooperation.” . . .
Of course, there were lots of logical errors in Piketty's book, but these data errors mean that even ignoring those problems his data doesn't show the increase in inequality that he was claiming. As someone who hasn't put so much weight on these types of discussions, I don't really care what the results show on this, but for those who do, I will be interested in knowing how they handle this. With even the Obama administration admitting that 27 veterans have died because of the waiting list scam, Democrats even having a hard time with the VA now. But a few years ago, while these problems were festering, liberals were pointing to the VA as the example that we should all follow. As to the Obama administration's explanation On Sunday’s “Meet the Press,” NBC News chief Pentagon reporter Jim Miklaszewski claimed, “You have a VA that is overwhelmed and under-resourced,” John Merline points out that was incorrect. Multiple surveys have found the VHA providing better care than most Americans receive, even as the agency has held cost increases well below those facing Medicare and private insurers…the VHA is an integrated system, which provides health care as well as paying for it. So it’s free from the perverse incentives created when doctors and hospitals profit from expensive tests and procedures, whether or not those procedures actually make medical sense. . . . Yes, this is ‘socialized medicine’… But it works, and suggests what it will take to solve the troubles of US health care more broadly. . . .
Take the hospital system run by the Department of Veterans Affairs, the largest integrated health system in the United States. It is fully government run, much more “socialized medicine” than is Canadian health care with its private doctors and hospitals. And the system for veterans is by all accounts one of the best-performing and most cost-effectiveelements in the American medical establishment. . . . Remarkably, Americans of all political stripes have long reserved for our veterans the purest form of socialized medicine, the vast health system operated by the U.S. Department of Veterans Affairs (generally known as the V.A. health system). If socialized medicine is as bad as so many on this side of the Atlantic claim, why have both political parties ruling this land deemed socialized medicine the best health system for military veterans? Or do they just not care about them? . . .
[A]ll of us, whether here in Washington or all across the country, have to stay focused on the larger mission, which is upholding our sacred trust to all of our veterans, bringing the VA system into the 21st century, which is not an easy task…. caring for our veterans is not an issue that popped up in recent weeks. 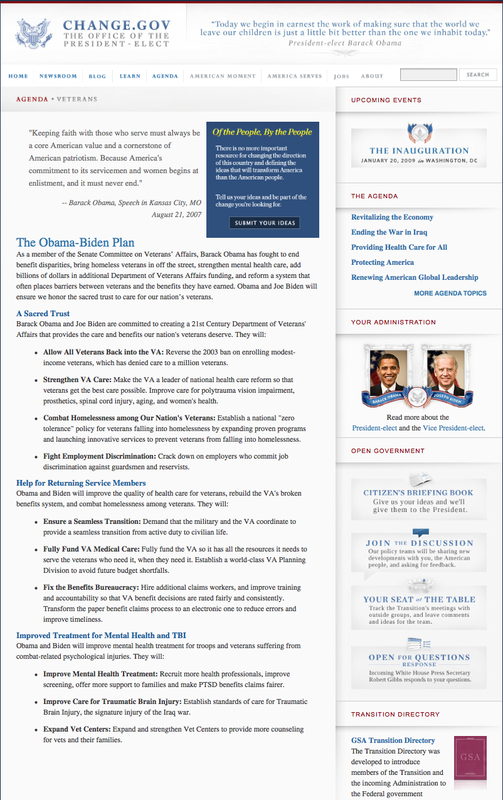 Some of the problems with respect to how veterans are able to access the benefits that they've earned, that's not a new issue. . . .
Click to make the screen shot from the website from when Obama was president-elect larger. Computers sure are making it a lot easier to do fancier Gerrymandering. From a data archive by Lewis, DeVine, Pritcher, and Martis at UCLA. Police are searching for three suspects involved in an armed robbery at Durham's newly-opened barbecue restaurant, The Pit, at 321 W. Geer Street. "They're doing great," restaurant owner Greg Hatem said. "One of them actually went to the hospital and was released. They took a good look at him, he's fine." Hatem also said there were a few patrons in the dining room while the robbery was happening in the kitchen area. Workers were able to ask them to leave, and got them out safely through the front door. . . .
NCGunBlog is the source of the picture of the restaurant's front door. Thanks to Tony Troglio for providing this information. Authorities got the call Tuesday morning around 8:40 a.m. from Sam Hall Road. They say the unidentified homeowner heard a noise from his back window. "And he heard the noise cutting the screen on the window. He got up and got his gun," said Sheriff Brindell Wilkins. The homeowner spotted Rodney Hanks, 20, wearing a hood and holding a gun and a knife. Hanks was shot once in the face. Three other suspects were with Hanks but ran away. . . .
Politico poll shows "mounting danger for Democrats"
The distribution of these voters across states is pretty important, but if this survey is remotely accurate, Democrats are in for a very rough election year. I guess that we will soon see if the Democrats start freaking out. On Washington DC's WMAL: Chipotle asked its customers to stop bringing guns to its restaurants, but has anything actually changed? My interview with Larry O'Connor about Chipotle's decision to no longer "welcome" guns in its stores (WMAL from 5:37 to 5:45 PM on May 20th audio available here). The main event: Dennis was nice enough to have both the police officer and myself to discuss the issue more fully on Friday, May 16th from 12:33 to 1:00 PM, audio here. The second half the interview was on the general issue of why more guns mean less crime. The first round: On Wednesday, May 14th, an individual who identified himself as a cop from Chicago called into the Dennis Miller Show during the first hour and indicated that he strongly disagreed with one of the points that John Lott had raised on Dennis' show on Wednesday, May 7th, 2:06 to 2:30 PM, audio here. Some facts: John Lott has written up some discussions on the changes in Chicago's crime rate here (most importantly) and here. There is also a useful article on the city producing fraudulent crime statistics available here. My newest piece at National Review Online: "A Reply to The Atlantic on the Death Penalty"
Death-penalty opponents are engaging in a lot of hyperbole. As an example, in the Atlantic this past Thursday, Andrew Cohen went after what I have written on the death penalty at National Review Online and in my book Freedomnomics, pushing the claim that “no reliable study by credible researchers has ever found any deterrent effect” from the death penalty. He also gets into the issue of race and quotes John H. Blume, a professor at Cornell Law School and death-penalty opponent, as asserting: “Every credible study has found a statistically significant race of victim effect” on who gets sentenced with the death penalty. If indeed they had surveyed all these peer-reviewed studies, they would have found that by more than 2-to-1, these studies found that the death penalty deters murders. . . .
"Conservative Filmmaker D’Souza Pleads Guilty to Election-Law Charges"
. . . Mr. D’Souza could face 10 to 16 months in prison and a fine of $250,000 under the terms of his plea deal. He could also lose the right to vote. U.S. District Judge Richard M. Berman, who will determine his punishment, set the sentencing for September. Mr. D’Souza was indicted in Manhattan federal court in January for allegedly breaking federal election laws and giving false statements to the Federal Election Commission. He was accused of illegally funneling $20,000 to Wendy Long, the Republican candidate who unsuccessfully challenged Democratic incumbent Kirsten Gillibrand, New York’s junior senator. Prosecutors said Tuesday that Mr. D’Souza had misled Ms. Long about the contributions, and that she would have testified against him if the case had gone to trial. Ms. Long wasn’t immediately available for comment. Mr. D’Souza’s attorney, Benjamin Brafman, had argued previously that Manhattan U.S. Attorney Preet Bharara’s office had engaged in “selective” prosecution by targeting a Republican, a criticism also echoed by retiring Harvard law professor Alan Dershowitz. Prosecutors pushed back against the claim. Law Blog noted earlier that Mr. Bharara’s office has won corruption convictions against nearly a dozen Democratic lawmakers in New York since President Barack Obama nominated him to the post in 2009. . . . The death-penalty debate goes on. After a piece that I wrote about the debate last week, National Review’s Charles C. W. Cooke wrote a response, followed later by a much stronger attack by the Washington Post’s Radley Balko. Cooke’s response was philosophical and drew a distinction between killing someone in self-defense and using the death penalty, though given the evidence that the death penalty deters murders and thus saves lives, that distinction isn’t as clear as he thinks. Over the period from 1977 to 2011, the rate of aggravating circumstances for murders was higher for black defendants for murder than it was for whites. Yet, despite that and with whites accounting for fewer murders than blacks (whites commit about 46.8 percent of all murders committed by whites and blacks), whites account for 57 percent of the white and black prisoners sentenced to death for murder. Finally, even after being sentenced to death at a higher rate than blacks, whites on death row over the decades have had a significantly higher probability of actually being executed than blacks. Over the years from 1977 to 2011, 65 percent of the total number of whites and blacks who have been executed have been white. This last point is particularly important, since everyone on death row has been convicted of murder with aggravating circumstances. If there is any bias, it is in the opposite direction that Balko claims. -- “DNA testing has shown that the criminal justice system is flawed — more flawed than most of the public had probably thought. Lott tries to dismiss these concerns, and it’s here that his statistics really get screwy. . . . I don’t know where Lott gets the number 34. I can’t find it anywhere at the Innocence Project link he provides. The actual number of people convicted of murder who were later exonerated by DNA testing is 104.” . . .
Chipotle asked its customers to stop bringing guns to its restaurants, but has anything actually changed? "Because of this, we are respectfully asking that customers not bring guns into our restaurants, unless they are authorized law enforcement personnel." . . . The one change that Bloomberg's groups can probably claim some credit for is banning police from carrying their guns with them off-duty at NFL games. Off-duty police have carried guns at games forever without a problem. Now they are worried about these officers. Zero Tolerance wackiness: "Fencing Team Banned From North Dakota State University Because Of 'Weapons Policy'"
What is next to be banned? Shot puts from track and field events? Fencing, an Olympic sport sponsored by more than 30 NCAA schools, involves two athletes engaging in what is effectively a sword fight with a foil, saber, or épée. The equipment is blunted and does not have any actual blades or sharp tips. Unfortunately, for the newly-formed club fencing team at North Dakota State University, fencing equipment counts as a weapon, and the club has been barred from practicing on campus. "The current interpretation of the non-weapon policy in NDSU...understands our fencing equipment as weapons," says the club's coach Enrique Alvarez. . . . Annual reports are available here for Florida, Kentucky, Michigan, Minnesota, Utah. 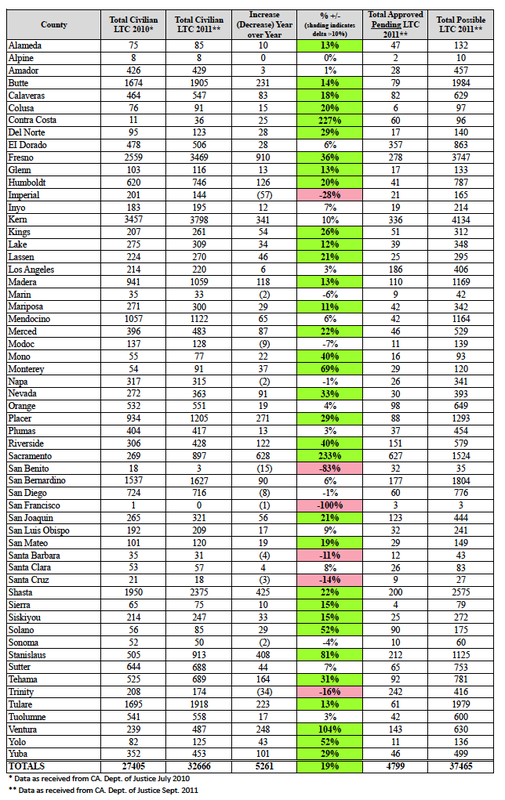 Florida currently has 1,254,529 active permits (April 30, 2014), Michigan has 436,856 (May 1st, 2014), Minnesota 170,916 active permits in May 2014, Utah 535,857 permits. Kentucky had 203,266 permits on December 31, 2012, though it has definitely increased since then. These five states have more than 2,601,424 permits. The Crime Prevention Research Center has the audio from Dennis' show on Friday with a discussion between myself and a person who identified himself as a Chicago police officer available here. I think that this an excellent discussion that went beyond crime rates in Chicago and covered much of the gun control issue.